I made a decision sometime ago to separate my interests in history from my interests in politics and faith. I dropped political topics from my blog completely and transferred faith topics to my other blog. There are times however when history and politics become intertwined to the point it’s difficult to separate the two. Such is the case I believe with the brouhaha over the Stars and Bars Battle Flag that flies over the Statehouse in South Carolina. I was born in and have lived most of my life in Wisconsin. Wisconsin became a State in 1848. When the Civil War broke out in 1861 Wisconsin answered Abraham Lincoln’s call for volunteers and supplied 91, 379 volunteers for service; most being assigned to the over 50 infantry regiments Wisconsin raised during the course of the war. Some units, like the Iron Brigade which consisted of the 2nd, 6th, 7th Wisconsin and 19th Indiana (the 24th Michigan became part of the brigade after Antietam) were immortalized. The brigade was nearly annihilated in the Antietam Campaign and devastated a second time at Gettysburg in the Union cause. 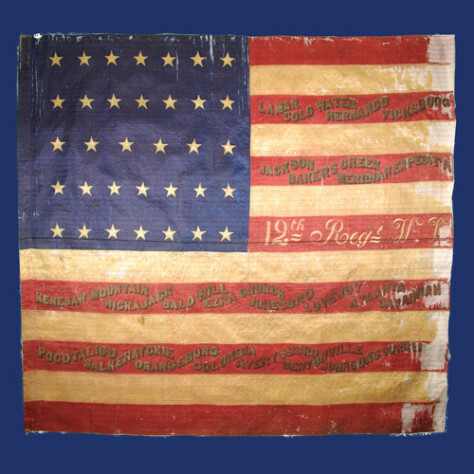 The battle flag of the Wisconsin 12th Infantry Regiment. Union Regiments usually carried two flags. One was the National Flag as illustrated here and the other was regimental. The regimental flag was of standard design and featured an American bald eagle as the central feature. Confederate units usually carried only one flag and they were often diverse. The Stars and Bars that we know today as being “Confederate” was actually the battle flag for the Army of Northern Virginia and was most common in that army. Confederate units often recorded battle honors in a similar manner as shown on the flag of the 12th Wisconsin. My own ancestors immigrated to the US after the Civil War as far as I can tell although my family’s surname is found in a couple of Wisconsin units. Two of my wife’s ancestors on the other hand appear in the roles of Union Regiments; one serving twice-the first time in the Kentucky Cavalry (Union) and the second time in a Wisconsin Infantry Regiment. The other ancestor of hers served in a New York Infantry Regiment until being invalided home with some disease. Over 12,00 Wisconsin volunteers would never come home. The number represents a little over 13% of those enlisted. The stats for the other Union States are not much different and the stats for the southern states are worse percentage wise. So why did they fight? Perhaps the biggest reason was simply loyalty to their state and a sometimes vague allegiance to the Union as well as a general distaste for slavery. I am certain that had I been around in 1861-65 I too would have found myself in Union blue rather than Confederate Gray or Butternut. What my primary motive to enlist would have been had I been around then I have no idea, but loyalty to Wisconsin seemed to be the norm for most. Whatever their particular motivation to enlist their sacrifices helped win the war, preserve the Union and free the slaves. Freeing the slaves was the major outcome of the Civil War and the butcher’s bill was paid by the lives of thousands of Union soldiers, black and white. President Lincoln at the Gettysburg Address laid out his attitude for when the war was over by saying, “With Malice toward none, with charity for all, with firmness in the right, as God gives us to see the right, let us strive on to finish the work we are in, to bind up the nation’s wounds.” Lincoln’s words were about healing when the north had just paid a terrible price in blood for an eventual outcome that would end slavery. The words were made by the nation’s first Republican President. It was the Republican Party which was abolitionist and not the Democrats although today you would think it’s the other way around. In fact, many northern Democrats led by the likes of failed General George McClellan were anxious to make peace with the south presumably securing the institution of slavery in the process. When General Sherman took the City of Atlanta in 1864 the north realized that the north could and would prevail and McClellan and his failed party went down to defeat in the fall elections. Cynical and insensitive does not begin to describe that attitude. Today the Democrats are the party of the far left and they follow Alinsky’s Rules for Radicals as if they invented them. The manufactured crisis over the Stars and Bars is a case in point. Some evil loser is shown with the battle flag after he guns down nine Christians who are black and the left mounts a full press cultural purge of all things southern including the flag that many of their ancestors fought under. Make no mistake my readers. I think South Carolina has been a bit tardy in removing the battle flag from the Statehouse. The motives which it put it in the first place were segregationist. South Carolina had a Democratic Governor from 1876 to 1975. The battle flag began to be flown over the statehouse in the 1950s-60s under Democrat Governors and now has been petitioned to be removed from the statehouse by a Republican Governor Nikki Haley. Gee whiz Democrats what took you so long? I think South Carolina should fly their State Flag over their statehouse. It’s a flag all South Carolinians could appreciate as the Palmetto Tree symbol dates back to the War of Independence when a new nation was forged-a nation that yes, became exceptional and inspiration for millions of immigrants including my own. Yeah, maybe it’s late but it’s being done so the left needs to shut up and desist with a further southern culture purge. There have been cries to remove the battle flag from Confederate graves, museums and other places of historical significance. Just for once have some common sense and get off the pc band wagon that has more in common with a communist state than it does with a people who just want to heal from the nation’s past and at the same time not ignore our history. If there is any malice going on here it’s the loony Marxist left that doesn’t let any crisis go to waste as they push their agenda of identity politics. Lincoln’s attitude should rule the day. It was the attitude of the people of the Charleston Church who forgave the sociopath who murdered their fellow Christians. They rightly identified the murderer as the perpetrator and the evil within him. They recognized the man’s need for redemption and Jesus Christ as of primary importance. Like northern soldiers, most southern soldiers had more loyalty to their individual states than they did to any central government. Let them be, with no malice toward them or their descendants. Their blood stains the same fields as our ancestors. Let them honor their dead as we do likewise. The Civil War is over. Let them be. Well-articulated and generally consistent with my views as a Southerner who traces his roots to the earliest years of settlement in Virginia and the Carolinas and one is descended from quite a number of soldiers who served in the Confederate Army. While slavery was clearly very wrong and we’re far better as a society with it long in the past, I believe we should be conscious of our 21st century sensibilities and careful not to judge too very harshly. The Civil War was far more complex than many of us care to appreciate in the “sound bite”-oriented world of today and accountability for the conflict more far-reaching than we’re often willing to accept. Lastly, it’s a real nit but you should know that the “Stars and Bars” flag was the name given to the First National Flag of the Confederacy rather than what most think of as the Confederate Flag, which in an elongated form was actually the Confederate Naval Jack and when in a square shape was the Battle Flag. Thank you for stopping by and the thoughtful comments. I have nothing but respect for the southern soldiers and their descendants.